Troubled software firm iSoft has reported a £344m ($649m) annual loss and said accounting problems have caused "deep disappointment". 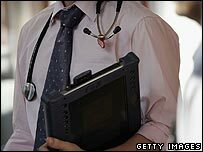 The firm, central to the £6bn upgrade of the NHS computer system, is being probed by regulators into accounting irregularities in 2004 and 2005. The investigation is believed to centre on whether the troubled firm misled investors over how much it had earned. But iSoft shares rose 48% as it sealed a deal with banks over its financing. ISoft delayed its results earlier this year after reports of accounting errors and its auditor, Deloitte, said it was unable to state whether the accounts just published gave a true position of the firm's financial position. The company reported a £343.8m pre-tax loss in the year to 30 April, mainly as a result of writing down the value of Torex, a company that iSoft bought in 2004. ISoft's results - which saw sales rise 8% to £201.7m - were reported under a new accounting policy after the firm admitted earlier this year that it had found evidence of irregularities affecting its 2004 and 2005 accounts. The problems - now being investigated by the Financial Services Authority (FSA) - mainly relate to the firm's revenues being stated earlier than they should have been. A previous independent probe into iSoft's accounting problems also concluded there were grounds for a more formal investigation and resulted in the suspension of commercial director Steve Graham. ISoft has been accused of breach of contract by Accenture and CSC, the two firms overseeing the project, which it denies. Acting chief executive John Weston said the last year had been a "turbulent" one and that a stream of negative publicity had damaged the firm's reputation and customers' willingness to sign contracts with it. "Long-term shareholders will be feeling deeply disappointed by the events of recent months," he said. "I share that disappointment but I am determined to see through a series of actions and change that I believe are necessary to put this company back on a solid footing." On Wednesday, growing concern about the health of iSoft prompted MPs to demand that the Department of Trade and Industry also investigate the company. The FSA's inquiry is the latest in a long line of problems to hit the group. In June, its chief executive Tim Whiston resigned while another employee has been put on a leave of absence. Announcing its results, iSoft said it was unable to predict at this stage what its revenues would be in the current year. It also said it was likely to cut at least 150 jobs, equivalent to 15% of its UK workforce, as it tries to reduce costs.